A mildly successful harness-betting weekend resulted from our Thursday blog, though certainly not one of our more prosperous efforts. This weekend’s choices spilled over into Sunday night, which is why this blog was posted later than usual. At Vernon on Sunday many of the Hambletonian characters from both sexes met for consolations and finals in the traditional post-Hambo “Zweig” stakes. The glamour-boy trotters went to post in the $360,000 Zwieg Memorial, with Hambo-winner Royalty For Life getting the worst outside post, 8, as he has in three of four of his recent starts (he won the Hambletonian elim heat from post 8 and the final from post 1). With no trouble getting to the top and no certain challenge, Royalty For Life won the Zweig at 6-5. Our choice, Aperfectyankee (14-1), was off the board. The filly Zweig final was handed to you in the entry of Mistery Woman and Shared Past. The stablemates finished first and second, respectively, to pay $3.60. Miss Steele, our choice, was third in the filly consolation and Hamdalla was last in the colt consolation. The Mohawk elims for next week’s major stakes—there were five—produced a few profitable situations. Our Metro Stakes elims featured a single winner in three miles with Arthur Blue Chip, who paid $4.20. We gave out this horse in last week’s Nassagaweya when he paid $17.20, this week the crowd caught on and dowsed any chance of a good price. Though we did not hit a winner in the Shes A Great Lady elims, we were second to dead-on favorite Precocious Beauty in the first elim with Bahama Blue. Our choice went off at 75-1 and paid $24.20 to place and $7 to show. With the $3-win favorite, the exactor paid a whopping $90.50. In the elims for the Canadian Pacing Derby for older male pacers, we were second with Sweet Lou (2-1) and off the board with Pet Rock. The Pet Rock elim featured a startling return to form for A Rocknroll Dance, whose soph career was well documented here along with a few big wins we endorsed, including the 2012 Meadowlands Pace. He has had a great deal of problems beginning with the latter part of his soph season and was dull starting his four-year-old season. He won off a fast pace at Northfield a few weeks ago but at Mohawk in the second “Derby” elim he won in a remarkable 1:47.4, a Canadian- and world-speed record. The crowd had much more confidence in him than we did and sent him off at 3-2. The first elim also surprised us as Bolt The Duer scored in a rare wire-to-wire victory. Both of these steeds meet Foiled Again, Aracache Hanover, Heston Blue Chip and Atochia, none of which needed to qualify in elims, in next week’s huge final. There were no seconds this week. 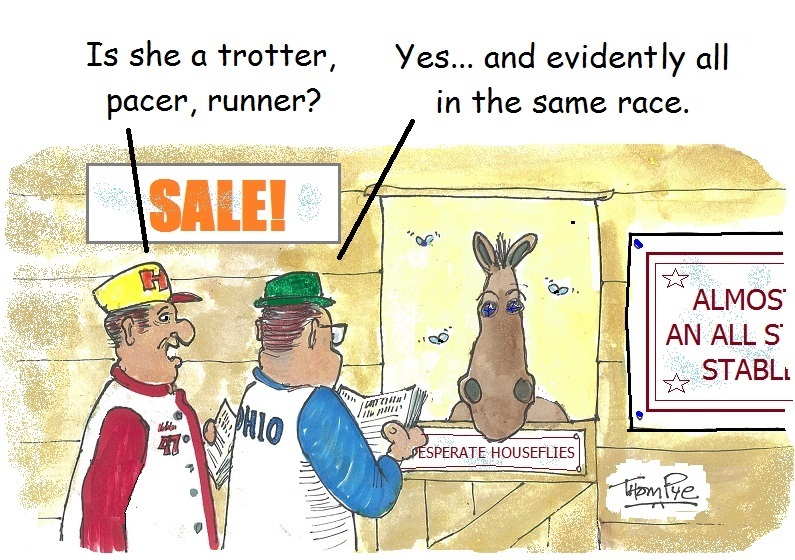 There are still many decisions to be made by connections of glamour-boy pacers as to which of them will be going to Ohio for the Little Brown Jug in September. Sunshine Beach’s trainer, Mark Steacy, told reporter Gordon Waterstone the colt might not drop into the box for the classic. 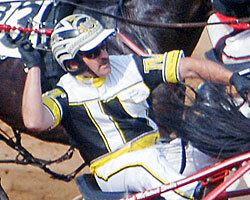 However, the fact that he beat Captaintreacherous at Pocono has team Steacy thinking twice. Without those two, the Jug fields could still be filled with the most talent to drop in the box in a few seasons. Possible but not commited colts include Adios-winner Sunfire Blue Chip; Rockin Amadeus, Twilight Bonfire; Johny Rock, Mach It So; Vegas Vacation, Odds On Equuleus and Wake Up Peter. 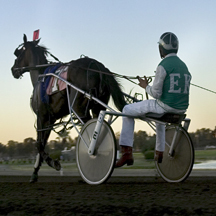 Harness racing will return to Freehold Raceway on Thursday, Aug. 29. Racing will take place on Thursdays, Fridays, Saturdays plus a special holiday card on Labor Day, Monday, Sept. 2. First-race post is 12:30 p.m. The new addition to the wagering menu is a 50-cent trifecta. Freehold will participate in the USTA Strategic Wagering Program with a $5,000 guaranteed Early Pick 4 pool (Races 2-5). The Freehold stakes program for August through October features New Jersey Sire Stakes Green Acres divisions for all ages and gaits, the Lou Babic paces and the Standardbred Breeders & Owners Association of New Jersey-sponsored Helen along with the Charles Smith trots and Marion and Harold Dancer trots and New Jersey Futurity Stakes. Alberta, Canada’s major standardbred sire, As Promised, passed away at the age of 24. For many years, As Promised was a champion the racetrack and in the breeding shed. Purchased by Keith Clark and partners in 1990, As Promised was well-bred but not a perfect standardbred specimen. Clark, a top Alberta trainer and driver, said, “He had a crooked hind leg.” Crooked or not, As Promised went on to win nine of 10 races as a freshman and $32,800. The colt came close to dying in California early in his sophmore season but recovered to dominate the Alberta circuit. “He was pretty much unbeatable at home,” said Clark. Running out of competition in Western Canada, As Promised was shipped to the Meadowlands where he took his lifetime best 1:50.2 win mark. Clark campaigned As Promised through the age of seven when he retired with 71 wins, multiple stakes titles and earnings of over $669,000. Clark ended up selling him because the stallion was getting busy as a stud and “I just didn't have time for him. In 2003, As Promised was the leading sire of three-year-olds in North America in the category of average earnings with $71,238. His popularity as a sire propelled him to be Canada’s most prolific stallion, breeding 307 mares in 2005 for a North American record.